Developed By : StrikeForce Technologies Inc.
GuardedID(r) Provides Powerful Identity Theft Protection Online or OfflineGuardedIDs innovative clickjack defense keystroke encryption anti keylogging technology and anti screen-logger protects you from identity thiefs favorite new tool... keyloggers. Industry experts state however that approximately 80 percent of keyloggers are escaping detection by leading anti-virus programs. This means that even with a current anti-virus program there is a good chance that a keylogger may be installed on the computer you use for sensitive activities.GuardedID secures your online browsing experience and your desktop program use against keyloggers offering protection for your credit card purchases banking email and other activities that should be kept private. 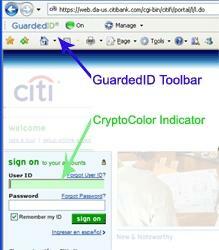 The clickjack defense system highlights areas where clickjacks could be hiding.Check out GuardedID today. New Try Before You Buy offer allows you to try GuardedID (Online coverage) for 30-days absolutely risk free.